Sanchez and his apologists will cite the injury to Armani Rogers as having derailed the season. But I'm sick of hearing that excuse. 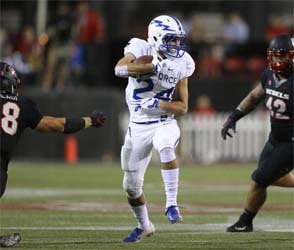 UNLV got torched by Air Force's third string quarterback. Don't talk to me about an injured QB derailing the season. 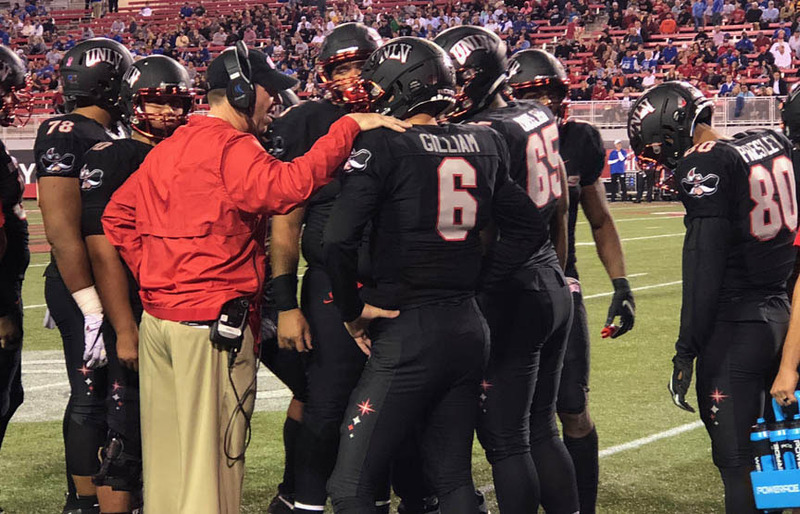 Besides, UNLV was built as a running team, not a passing team, and backup Max Gillium is probably the better passer anyway. It took Max a couple games to get going, but once he did, he played well. Not well enough to win games, but again, this team wasn't built to be a passing team. Sanchez and his apologists might also mention that 2018 is the first season in which Sanchez's team won fewer games than it had the previous season. 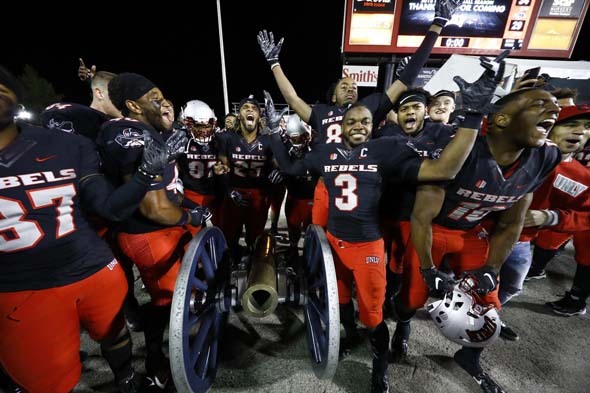 UNLV went 5-7 in 2017, and had its bowl hopes dashed by a two-win Nevada team. So maybe this is one speed bump on the road to success, and the overall trend has been positive so far. I don't really buy that either. 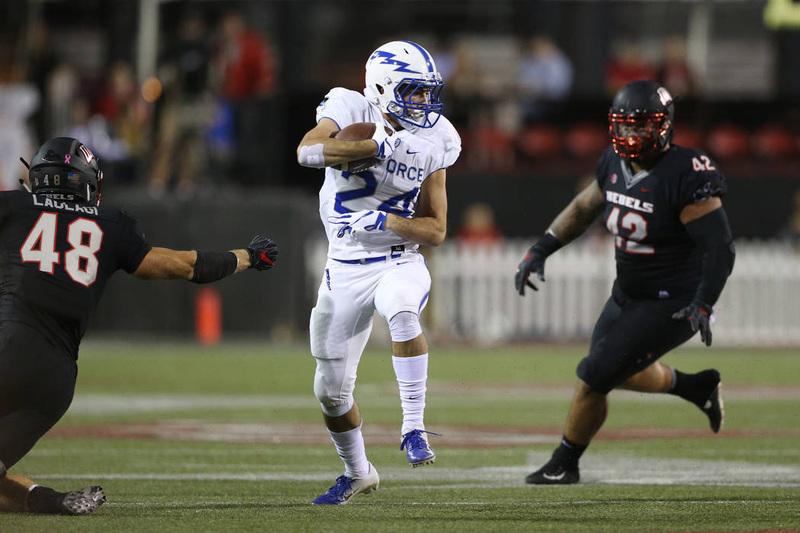 UNLV was un-competitive in most of its games this year, and it wasn't because of lackluster play by a backup QB. It was because the defense couldn't stop anything all season long. 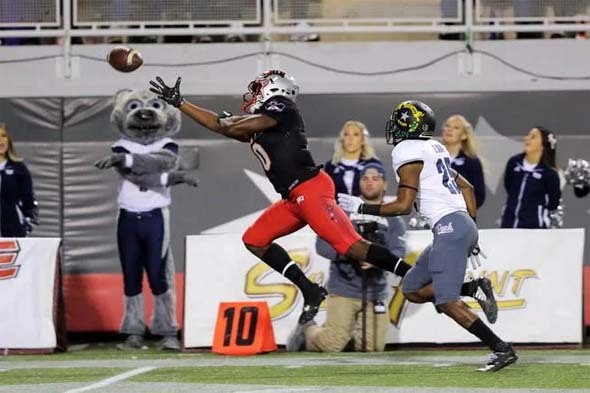 Bad defense has been a hallmark of UNLV football for as long as I can remember, and Sanchez hasn't done anything to change that in his four years with the team. Now, it might sound like I want Sanchez to be fired, but that isn't actually the case. I think he deserves one more season. I like the energy that Sanchez has brought to the team. I like the flair that he's brought to the uniforms and field markings. Even though I prefer the 2009-2011 jerseys, I do like how Sanchez's uniforms utilize some of the unique aesthetics of the city of Las Vegas. That new logo is pretty bad, though. I do not much care for this alternate logo. I also feel that the team has had more of an identity under Sanchez. 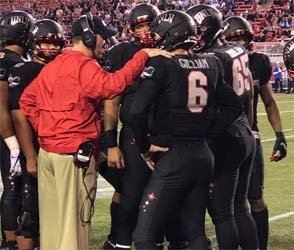 It isn't just the Vegas-inspired uniforms and field decals; it's also in the way that the team has established itself as a dominant power running team. Now they just need a defense to match. So it isn't necessarily the case that I want Sanchez gone. What I want is for him to learn from his mistakes and get better. I'm sick of UNLV hiring a new coach every five years and having to start over from scratch. That isn't good for the players, and it certainly doesn't help with recruiting. Nobody wants to play for a school if they don't trust that the coach who recruited them is still going to be there when the player graduates in four or five years. What I want is for defense to be Coach Sanchez's primary recruiting goal for the next year or two. If UNLV does fire Sanchez and has to look for another coach, I hope they find somebody who is a defensive-minded head coach. Defense has been the Achilles Heel of this team for so long, and I don't think we're ever going to be a consistent program until defense becomes a coaching and recruiting priority. It doesn't matter that UNLV was scoring almost 30 points per game this year, because they were giving up almost 40. If UNLV is going to lose, I'd rather that the games remain relatively low-scoring and close. I'd much rather lose 16-9 than 50-21. At least in a low-scoring game, you're never more than a couple big plays from winning the game. A single kick return, or pick-six, or fumble could be all it takes to take the lead in such a game. But if the other team is putting up 40 or 50 points, you'll need a lot more than a single big play in order to keep pace. If Sanchez continues to be unable to coach this defense into shape, then he should be fired! And this is actually the biggest reason why I think Sanchez might not be the right fit. From what I understand, he's very hands-off when it comes to defense. Maybe that needs to change? 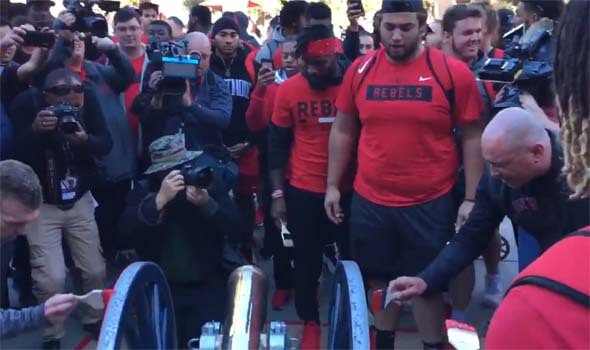 Oh, also, I'm definitely in favor of moving the UNLV - Nevada rivalry game to Nevada Day weekend, just as long as it's in the afternoon and doesn't interfere with Halloween parties and/or trick-or-treating. Sanchez may have secured his job with the comeback win over Nevada.